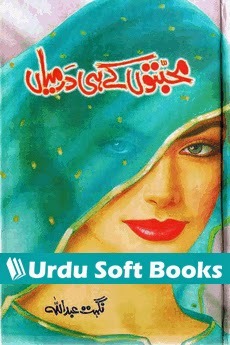 Mohabbaton Kay He Darmiyan Novel by Nighat Abdullah Download PDF Books or read online another beautiful Romantic Urdu Novels, Read "Mohabbaton Kay Hi Darmiyan" and enjoy 4 different romantic stories in Urdu language. Download PDF Books or read online another beautiful Romantic Urdu Novels, Read "Mohabbaton Kay Hi Darmiyan" and enjoy 4 different romantic stories in Urdu language. Mohabbaton Kay He Darmiyan Urdu novel is authored by Nighat Abdullah who is a well known Urdu author, Urdu short and long stories writer, screenwriter, drama script writer and a famous Urdu novelist from Pakistan. She has authored various Urdu Novels which were appreciated not only by Pakistani peoples but also by Indian. Nighat Abdullah usually focuses on social issues in her novels but she is also best known for her romantic Urdu novels. She has written a lot of Urdu social and romantic novels. The author of Mohabbaton Kay He Darmiyan, Ms. Nighat Abdullah is favourite Urdu novelist for teenagers because of her romantic Urdu novels. Mohabbaton Kay He Darmiyan is one of her most selling Urdu novels. You can download or read online Mohabbaton Kay He Darmiyan Novel by Nighat Abdullah and other Urdu Books, PDF Books from each page of this blog using below download link.